We want to see how talented you all are!!! Are you a Dancer? Artist? Singer? Rapper? Gymnast? Show off your talent this May for your chance to win. 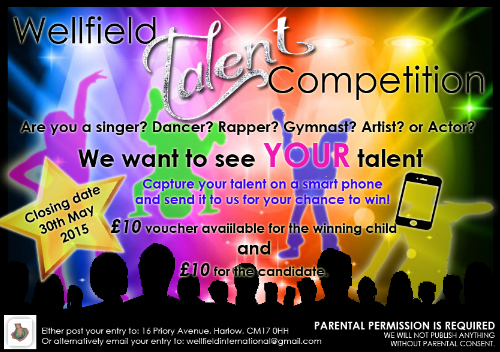 You can send your entries to office@wellfieldinternational.co.uk or post your entries to 16 Priory Avenue, Harlow, Essex, CM17 0HH. The competition closes on the 30th May 2015. Please see the leaflet for further details. We cannot wait to see all of your entries! !